I’m not sure what happened. There was Pinterest. I was sick. There was a plastic bin full of felt and leftover sweaters in the basement. 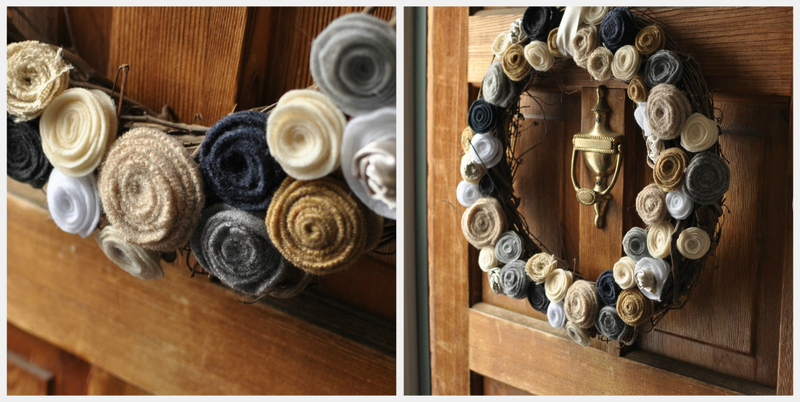 Yada yada yada….I made a wreath. I’ve chronicled my wreath making experience previously. The one that resulted in bloodied fingers and blood-stained ribbon and looked fairly awful. So I wasn’t necessarily chomping at the bit to make one, but the ‘season’ is upon us. And my door is bare. And I have this hot glue gun that I’m entirely incapable of using. At least, according to my recently seared off fingerprints. The process went something like this. Lug felt and wool up flight of stairs. Cut circles with heavy-duty scissors that only Arnold Schwarzenegger should use. Tend to blisters and calluses on fingers caused by vile scissors. Twirl circle-strips into flowers. Tend to carpal tunnel syndrome caused by rotating wrists in unheard of directions. Hot glue flowers. Burn fingers. Swear. Tend to children’s newfound vocabularies. Take three children to Michael’s on a Friday afternoon during the ‘season’ with, inexplicably, only one cashier ringing up purchases, to purchase a twig wreath or whatever it’s called. Clench teeth. Consider purchasing mouth guard to prevent early-onset-nubbin-teeth. Go home and glue flowers to twig wreath. Apply molten glue to fingertips. Swear. Tend to children’s vocabulary. Please note, some of those flowers were made from old cashmere sweaters. Eat it, Pinterest! Youre hilarious! And the wreath is beautiful!! It’s lovely! Would you make me one, please? Thanks Ashley and Heather! Ma, you can take this one with you when you come visit. Vicky, note this post was more about my lack of fingerprints than my lack of creativity. Seriously, how do people use glue guns without harming themselves? !